If you want to know how to apply eyeshadow PROPERLY, you’ve come to the right place. I’ve had an unhealthy love for makeup and makeup brushes for as long as I can remember, but no matter how hard I try, I’ve never been able to make my face nearly as glamorous as the gals that work at Sephora. For a long time, I figured it was the quality of my beauty products since I tend to opt for drugstore makeup over higher end brands, and while I typically have more luck with the more expensive beauty products I own, I’ve learned that it’s my application techniques (or lack thereof) that are the problem. The good new is that is YouTube is filled with all kinds of step-by-step tutorials to teach newbies like myself how to apply eyeshadow, and thanks to Goss Makeup Artist, The Makeup Chair, Jaclyn Hill, and many others, I’m starting to feel more confident in my make-up application techniques. Check out my top 5 eyeshadow palettes below, as well as my favorite makeup tutorials that will teach YOU how to apply eyeshadow like a pro. 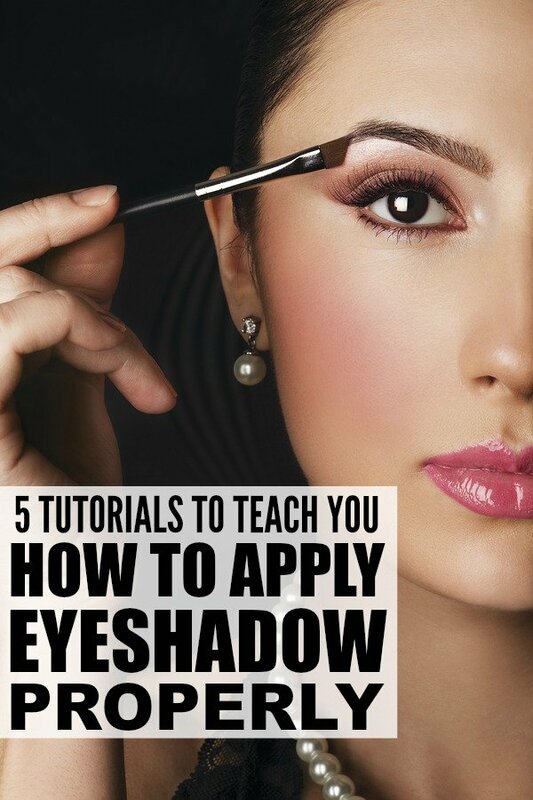 This is a quick tutorial that is filled with fabulous tips and tricks to teach you how to apply eyeshadow. My biggest takeaway from this tutorial was to use the right brushes. I used to own ONE brush for all of my eye makeup needs, and it just wasn’t cutting it, so I splurged on the Sigma Beauty Essential Kit and it has literally changed my life. Can’t afford the entire set? Start with the Basic Eyes Kit. You won’t regret it! This is a great tutorial for those who are looking for makeup tips using budget-friendly products that can be purchased at a drugstore. Jaclyn still used her ANASTASIA Beverly Hills Brow Wiz, which is NOT a drugstore brand, and while I agree it’s hard to find something comparable, I’ve had a lot of luck with the Benefit Precisely My Brow Pencil. Oh, and the Late Night Latte eyeshadow looks (almost) as good on me as it does on Jaclyn. I highly recommend it! I never used eyeshadow primer before watching this tutorial (to be honest, I didn’t even known it existed), but after doing some research, I decided to splurge on the Urban Decay Eyeshadow Primer Potion and I haven’t looked back. Not only does my eyeshadow (even my cheap drug store palettes!) go on smoother, but I never (EVER!) get that annoying grease line on my eyelids anymore. It has been a serious game-changer for me! If you want an excuse to splurge on one of the Urban Decay Naked Palettes, this tutorial is it! Emma will show you how to look like you’ve put more than a little effort into your appearance in record-breaking time using only a few products and brushes. This tutorial will blow you away. This is a great collection of tips and tricks outlining all of the things you SHOULD and SHOULD NOT do when applying eye shadow. I’ve learned a lot of these the hard way! You’ll notice she recommends using synthetic makeup brushes, which is another reason why I love my Sigma Beauty Essential Kit – the brushes are all synthetic, which means better product application and blending at a much cheaper price than higher end brands like MAC! Whether you’ve made a mess of your eyeshadow, or just want to lift your eyes, this trick by gossmakeupartist will blow you away! I hope these ‘how to apply eyeshadow’ tutorials help you as much as they’ve helped me! If you found these tutorials to teach you how to apply eyeshadow properly helpful, please share them on Pinterest! And if you’re looking for other beauty-related tips and tricks, please follow our Beauty board where we share all kinds of fabulousness!